During my weekend in Raleigh (3 weeks ago, yeah I'm behind), Matt and I had some very exotic cuisines. 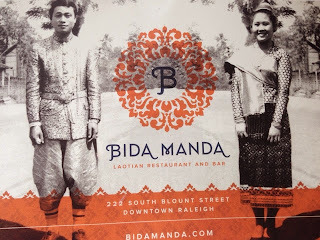 From our mix of urban street food to Indian takeout and also our first try of Laotian food at the restaurant Bida Manda. This place had incredible reviews on Yelp so we made a reservation over a week in advance and couldn't get any time after 5:45pm! This place seems very popular in the Raleigh area and after dining there I can see why. The restaurant has a beautiful, exotic atmosphere with low lighting. They also have a great bar and friendly servers. 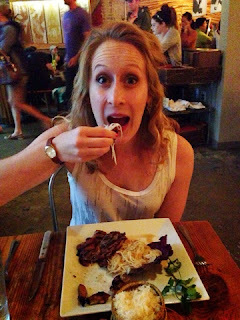 Here was our meal in pictures. We started off with the crispy rice lettuce wraps which came with a great peanut oil for dipping. I got the Green Papaya salad with grilled ginger and garlic pork neck. 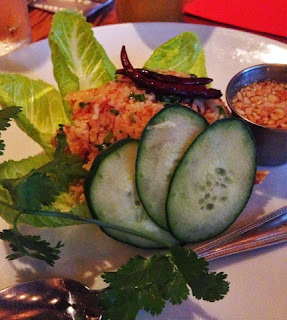 It also came with sticky rice and had a spicy lime sauce. The meat was super tender and savory and the papaya salad (the noodle looking stuff behind the meat) had a very unique spicy flavor. 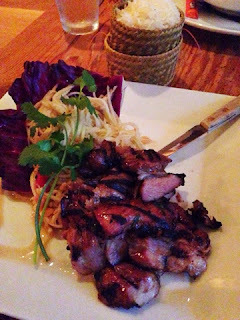 I ended up eating pieces of the meat, salad, and the sticky rice all in one bit to get the maximum flavor. The server told me that it was traditionally eaten with your hands. I obviously dug right in. Matt had the Crispy Pork Belly Soup. It was highly recommended but I was still wary of a $16 soup. Boy was I wrong. It was like the best combination of curry and pho. 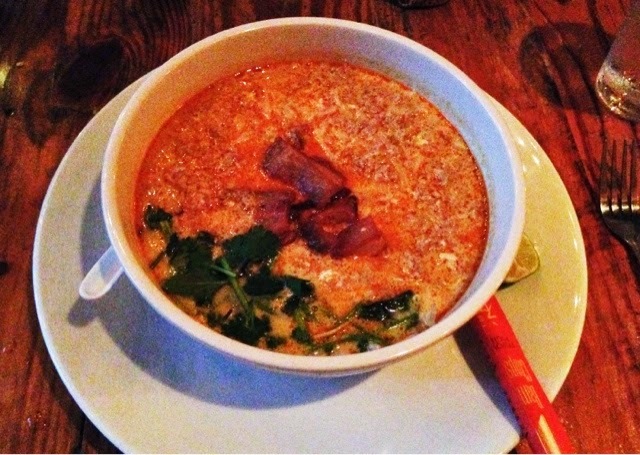 The pork belly was like a crispy bacon and was mixed with vegetables, a creamy coconut curry broth and rice noodles. It was huge and very filling. 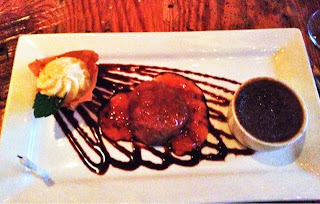 It had been my birthday weekend so we got a trio of desserts. I particularly loved the coffee creme brûlée (on the right) because I'm not currently drinking coffee and Matt loved the apricot cobbler in the middle. Overall the meal was completely fabulous. Between the food and the atmosphere I will definitely be coming back here my next time in Raleigh!